I recently did a beer trade with someone on the West Coast and he wanted to add another bottle to the deal. He listed off a bunch of breweries and one was Ninkasi out of Oregon. 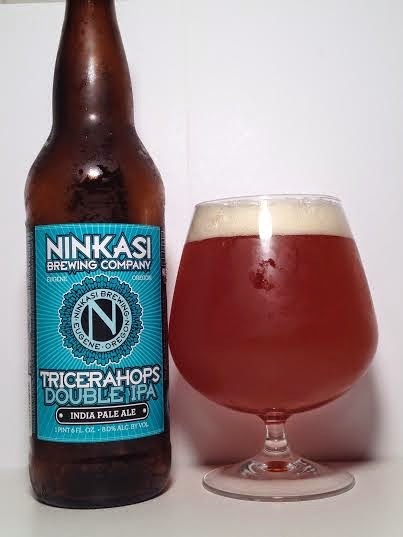 I picked this one because I've never had a beer from this brewery, so here we have Ninkasi's double IPA: Tricerahops. Pours a dark, rusty orange with a slightly off-white head. Big floral hops with an earthy aroma on the nose with an underlying garlic and onion too. I would describe my initial reaction to this beer as a "flower bomb" due to it's in-your-face floral hoppiness. This is followed by tons of acidic citrus and that onion flavor from the aroma. The majority of this is bitter, floral/earthy hops with the touch of garlic on the end. I'm not a fan of West Coast IPA's that bombard you with garlic/onion, but this remains very drinkable with those flavors and for the 8.00% abv. It finishes dry with no unpleasant aftertaste. My first Ninkasi beer was a solid showing. Those who don't like the floral hop varieties may want to stay away, but even if you don't, the citrus notes and drinkability balance it out to make this an enjoyable offering.